How do I use Blink for the first time? How does Blink offer these prices? Does Blink need a copy of my prescription? Save whether you have prescription drug coverage or not. Available at local pharmacies serving every community. Select how to get your meds and pay online to save. Show your proof of purchase. Pay nothing at the pharmacy. Get your medication delivered with free shipping. Need your medications fast? You can pay online with Blink and pick up at a participating pharmacy. Get the exact same medication, at much lower prices, delivered right to your door. Blink Health Pharmacy works with your doctor or pharmacist to take care of transfers, refill requests, and more. 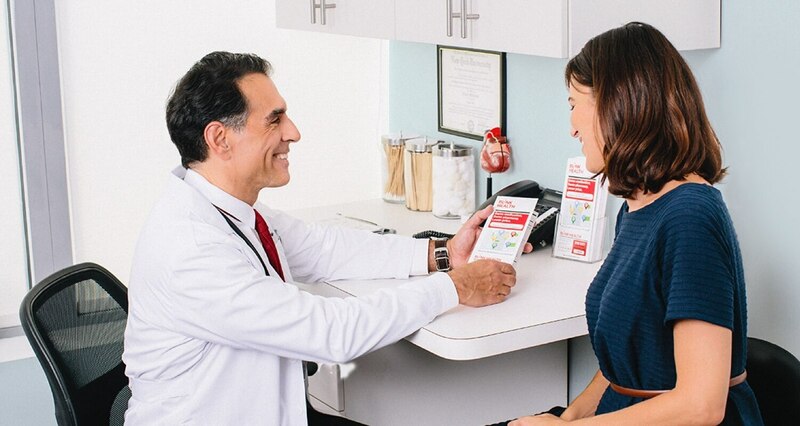 Your prescription is filled and shipped by a certified, US-based pharmacy near you. Our licensed pharmacists are standing by to answer all of your questions. Blink negotiates with the pharmacy industry on behalf of all Americans and uses technology to cut out middlemen. So you can get the same medication at much lower prices. Simply pay online and pick up at a trusted pharmacy nearby, or get your medications delivered right to your door with free shipping. Blink Health customers save on average $70 per prescription filled. There are two ways to use Blink. We offer free home delivery or free pickup at a participating pharmacy. Either way, search for your medication on BlinkHealth.com or in our mobile app. Select home delivery or local pickup, and we’ll guide you through the process at checkout. If you're picking up, you'll need your proof of purchase — your Blink Card — which we'll email and text to you after checkout. You can print it out, or just show your phone to the pharmacist. Ask them to process it as the primary payer — you’ll pay nothing at the pharmacy. Yes. You won’t need your prescription to complete your purchase, but you do need a valid prescription in order to get your medication. You can use an existing prescription from your doctor or we can help you get prescribed online by a licensed physician after checkout. Online doctors’ prescriptions are available for select medications in participating states and are not guaranteed. Restrictions apply. If you’re using an existing prescription, our pharmacy team can transfer it to Blink or a participating pharmacy at no charge. Even though Blink doesn't need to see a copy of your existing prescription, the pharmacy will still need a valid prescription either as an e-prescription or as a paper prescription. If you've selected your medication to be delivered to your home, Blink will transfer your prescription to our pharmacy team, or you can ask your doctor to e-prescribe directly to "Blink Health Pharmacy". If you have any questions, please call our US-based customer care team at 1 (855) 979-8290. Does my pharmacy accept Blink? You can use Blink at 35,000 participating pharmacies nationwide, including Walmart, Albertsons, Kroger, Publix, Costco, Kmart and thousands of other regional chains, groceries and neighborhood drug stores. If your prescription is currently at a pharmacy outside our network, we’ll help transfer your prescription to a participating pharmacy after the checkout process. Transfers are free and easy. We also offer free home delivery, so you can get medications delivered to your door with free shipping from a certified US pharmacy in our network. Does Blink contact my pharmacy to fill my prescription? No. If you're using Blink at your local pharmacy, fill your prescription at the pharmacy like you always do. You can have your doctor call the prescription in, e-prescribe or provide you with a physical copy to give to the pharmacist. For existing prescriptions, request your refill from the pharmacy as you normally do and ask your pharmacist to process Blink as the primary payer. If you're ordering medications with free home delivery, we'll walk you through the process at checkout — our pharmacy team will transfer your prescription from your doctor or current pharmacy. Can I use Blink if I have prescription drug coverage? Yes! Check the Blink price and compare it to how much you’d pay with your prescription drug coverage. Our customers are surprised that Blink’s price can be lower. If that’s the case, purchase your medications with Blink without using your drug coverage. Is Blink free to use? Blink is free to use! You can search for the price of your medication on our app or website with no commitment or fees, whatsoever. From Maine to Texas to California, doctors and nurses recommend Blink as an affordable way to get the medications you and your loved ones need. Our customer care team is available Monday - Friday 8AM - 10PM EST, and Saturday and Sunday 9AM - 7PM EST. Meropenem is used to treat a wide variety of bacterial infections. This medication is known as a carbapenem-type antibiotic. It works by stopping the growth of bacteria. Our support team is available Monday through Friday 8AM - 10PM EST, and Saturday and Sunday 9AM - 7PM EST. Blink Health will always honor the price reflected at the time you purchased your medication. Your final price is based on the medication you pick up at the pharmacy. If you pick up a different form, dosage, or quantity, you will be charged or credited the difference. Blink Health reserves the right to cancel a transaction and refund you if the underlying cost of the prescription drug changes significantly after you have purchased your medication. Blink Health reserves the right to change its prescription drug prices in real time based on supply and demand trends and other factors. Any savings claims made by Blink are based on U.S. retail prices without prescription drug coverage. *Retail Prices (Cash Prices) vary among pharmacies. The Retail Prices displayed are estimates based on multiple sources, including price lists, historical claims and data provided by pharmacies. Our Price Match Guarantee covers generic drugs. Additional conditions apply. For more details visit our Price Match page. †Delivery may be subject to delays. Free shipping is available for most orders through USPS first class shipping. If an order is placed, or if a delivery period falls, on a USPS holiday, the delivery time window will be extended by additional days, as applicable. No deliveries on Sunday or USPS holidays. Home delivery orders ship from a licensed, US based pharmacy after a valid prescription has been received. No home delivery orders will ship without a valid prescription written by a prescriber. Blink Health's pharmacy team will transfer prescriptions from other pharmacies or prescribers. Home delivery orders may be subject to delays if those pharmacies or prescribers do not immediately respond to requests to transfer prescriptions to Blink Health's pharmacy team. ‡Excludes sildenafil and finasteride. Blink Health is not sponsored by or affiliated with any of the pharmacies identified. The pharmacy trademarks and logos above are the property of their respective owners. Blink Health is not offering advice, recommending or endorsing any specific prescription drug, pharmacy or other information. Please seek medical advice before starting, changing or terminating any medication or prescription. Disclosures: Blink Health is NOT insurance or a Medicare prescription drug plan. Users are obligated to pay the price presented during the checkout process. Blink Health is available to users at participating pharmacies only. No enrollment or periodic fees apply. Our address is 233 Spring Street, 8th Floor East, New York, NY 10013, 1 (844) 366 - 2211, www.blinkhealth.com.